Uses : It is one of the best drug for diarrhoea. In chronic diarrhoea & to check blood coming from stool, it should be given with Isobgol, caster oil or Indrayav. According to Ayurveda, the bark is useful in treatment of piles, skin diseases and biliousness. The bark is used externally in case of skin troubles. The bark is mostly mixed with cow urine and applies it in affected parts. In treatment of urinary troubles, the bark is given with cow milk. The fresh juice of bark is considered good to check the diarrhoea. In bleeding piles Decoction of Kutaj bark with sunthi checks mucus & blood. Application of this herb is useful in Rh. Arthritis & Osteoarthritis. 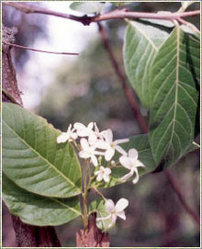 The bark is used in chest affections and as a remedy in diseases of the skin and spleen. It is a well known herb for amoebic dysentery and other gastric disorders.